I’ve moved to northern Wisconsin, and I have way too much yarn. It only makes sense that I create tons and tons of winter accessories to wear! 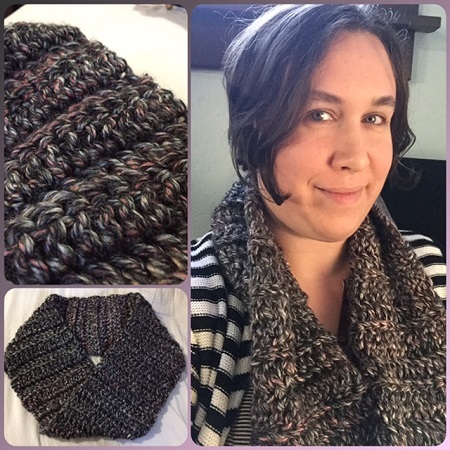 Today’s post features scarves, shawls, and cowls that I’ve crocheted over the last few months. 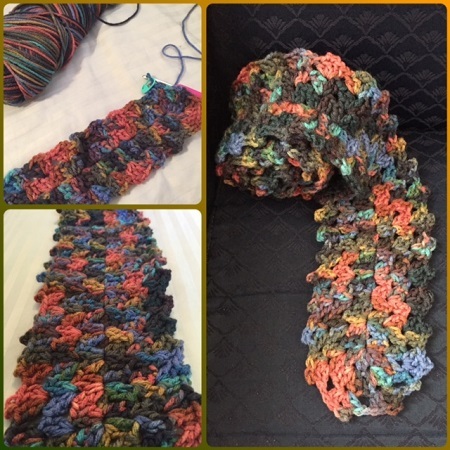 The first scarf I crocheted was extraordinarily simple, just one stitch all the way through. 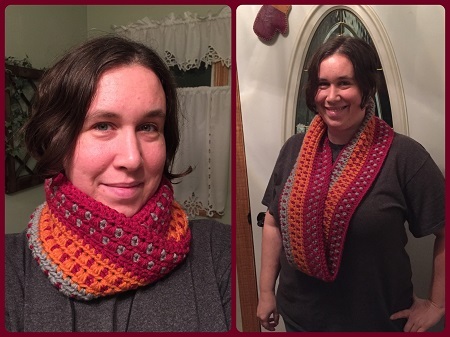 However, the scarf looks amazing because of the yarn I used. 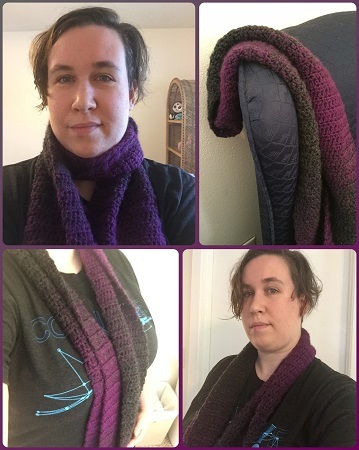 This is Lion Brand Scarfie Yarn in charcoal/magenta, and the pattern just came straight from the skein. It was tons of yarn (over 300 yards) and the entire skein was used. 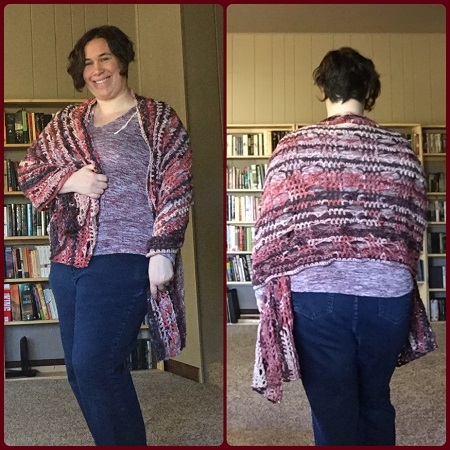 The transition from charcoal to purple and back again is perfect, and the yarn is lovely-soft. Despite how simple this is, I know it’s going to be one of my most-used scarves this winter. 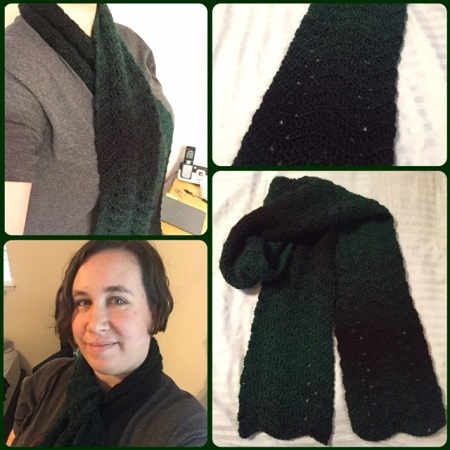 I loved that Scarfie yarn so much that I bought a second skein of it, this time in forest/black. 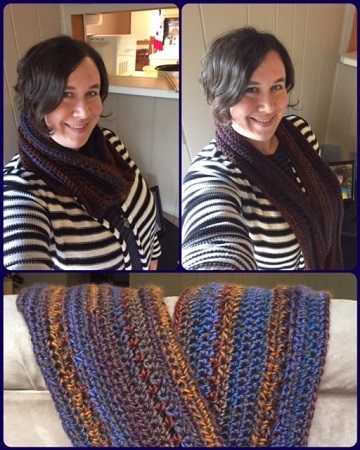 I found a cute chevron scarf pattern at Grow Creative, and got to work! This was the super-satisfactory result! What would moving to Wisconsin be without a fun autumn rainbow scarf for my niece? 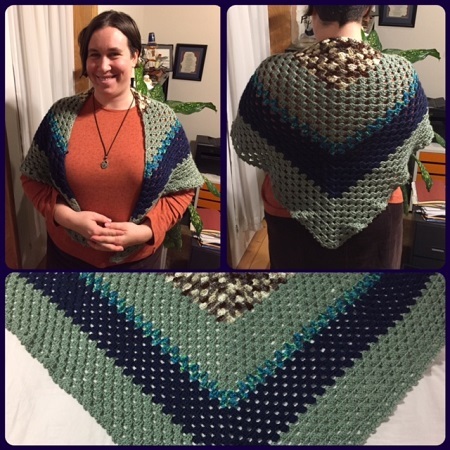 Pattern from One Skein Wonders, yarn is Red Heart in Earthy. I have a lot more of this kind of thing that I’d like to make in the future, but I’m set for the upcoming winter season, and so will turn my brain and fingers to a different kind of project now! Looks like you are having lots of fun with this!! I think you are all set for that cold weather we will soon be having!